With a growing card pool offering so many places to begin our journey, the first card choice is not easy. 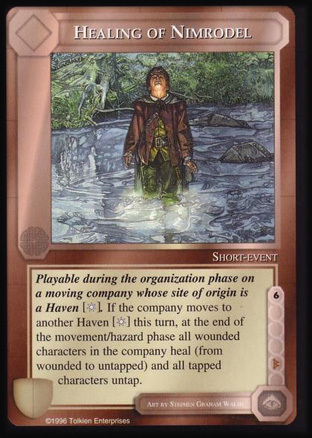 It would seem fitting to our quest to begin somewhere among the cards from the Lore sphere of influence in the Core Set though, as this would be closest to our metaphorical home within the context of our experience of the game. But which card to feature? 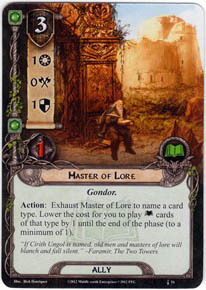 Walking into my local gaming shop to pick up expansions, I remember finding art sleeves that FFG specially produced for the LOTR LCG on the wall pegs. 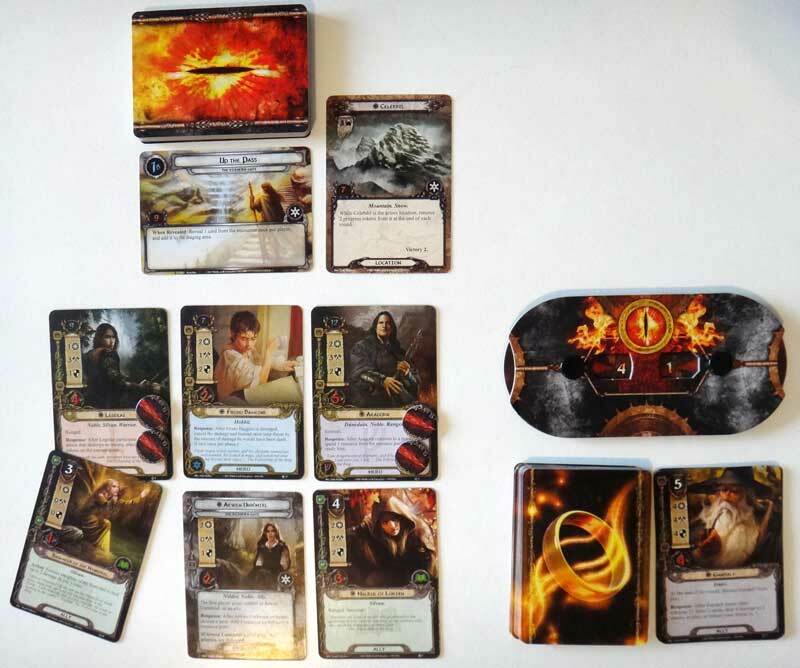 The sleeve art options of the One Ring and Eye of Sauron seemed obvious to me, as did the third choice, a portrait of Gandalf the Grey. But I was a bit puzzled by the fourth offering in line. It was a striking golden maiden lifting her arms in supplication beside a stream. At first, I couldn’t even recall seeing this card in the Core Set and wondered if this character might be from a future expansion. 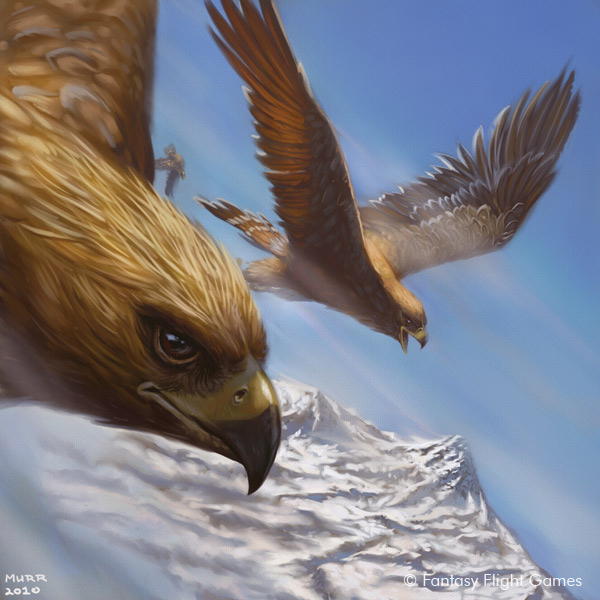 Was it Goldberry, the enigmatic companion of Tom Bombadil in The Fellowship of the Ring? Who could be such a significant character as to warrant a place beside three of the most iconic images of the Tolkien saga as an officially licensed art sleeve? Returning to my cards upon coming home, I discovered that this mysterious maiden was a Lore Ally from the Core Set titled Daughter of the Nimrodel. Who is “the” Nimrodel? An Elven race? A particularly pompous noble who uses a definite article before his name? With a glance down to the flavor quote from Tolkien’s text, my journey into the deeper legends of Middle Earth began. And so, here too, we take the first step in our quest to become “masters of lore”. Click for high resolution scan of this entry’s featured card. 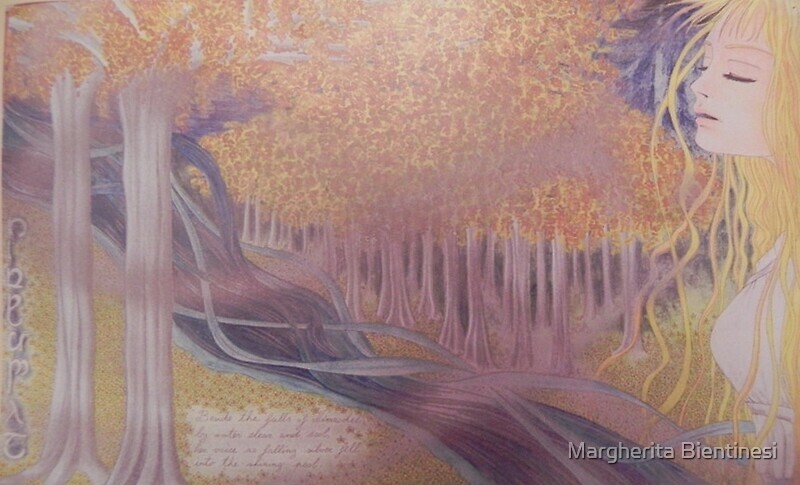 This quote is taken from Chapter VI of Book II in The Fellowship of the Ring titled “Lothlórien”. The Company has just lost Gandalf in the Mines of Moria and is being hastened on their way to seek refuge in the Golden Wood of Galadriel. As they approach the eaves of the forest, they hear water “splashing over a fall away among the shadows” and Legolas urges them to rest so that “the sound of falling water may bring us sleep and forgetfulness of grief”. 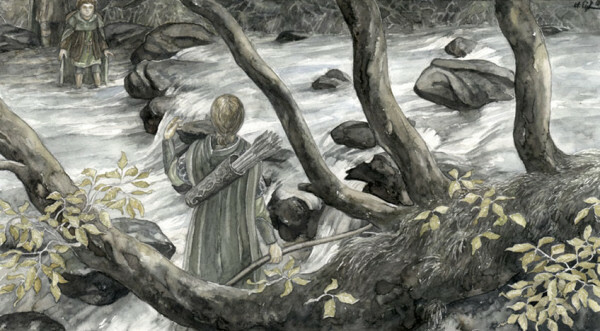 While they sit and eat, Frodo “fancied that he could hear a voice singing, mingled with the sound of the water” and Legolas tells him this is the voice of Nimrodel, “an Elven-maid of old” who once resided by the stream. He then lowers his own voice and begins to sing a tale called the Lay of Nimrodel. There are several stirring recordings of this song posted on YouTube but I’ve embedded this one because it’s easier to imagine Legolas’ recital performed by a male singer, though we’re told in the text that his voice is “hardly to be heard” and ultimately “falter[s]” before he can sing “but a part” of the song. Like many readers, I simply skipped most of the songs the first time I read The Lord of the Rings. It was enough for me to keep up with all the characters in the Fellowship without also remembering all the historical allusions. Plus, I was so engaged in the plot that the songs came as unwelcome diversions when I just wanted to find out what happened next. It was only on repeat readings that I’ve come to really appreciate the beauty of the songs and begin to realize their deeper relevance to Tolkien’s central themes. And it was only with seeing the Daughter of the Nimrodel art sleeves hanging on a peg at the games shop, that I finally took the time to savor this particular song and the sense of loss and foreboding it is meant to evoke in this chapter. In short, the Lay of Nimrodel is about an Elven princess who fell in love with a former king of Lórien named Amroth. 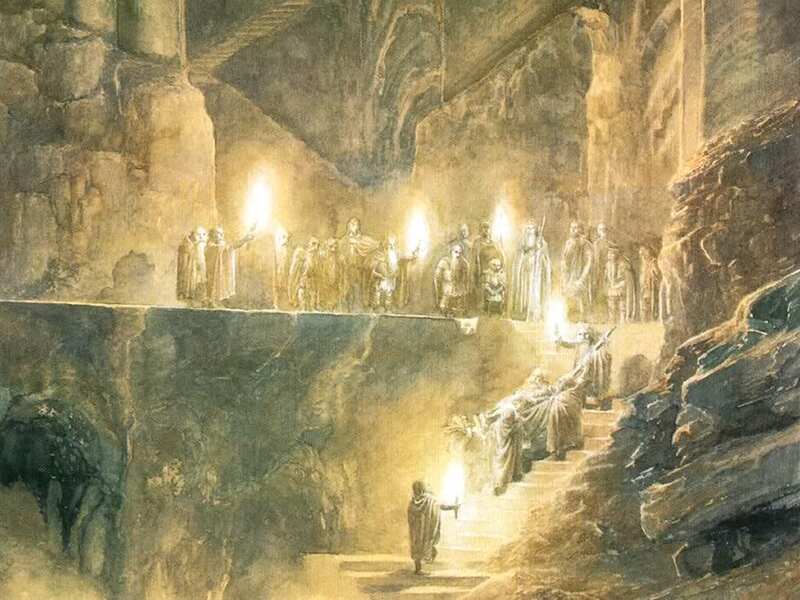 This was around the same time that the Balrog was awakened by the Dwarves in the deeps of Moria and Nimrodel flees in terror towards the havens to catch a White Ship out of Middle Earth, across the sea to the Blessed Realm (where about 1200 years later Bilbo and Frodo get on a similar boat in the third or fourth ending of The Return of the King film). Nimrodel’s lover Amroth decides to leave his kingdom and head West to meet her there but while he makes it safely to the ships, she tragically gets “lost” in the White Mountains where her final fate is unknown. In the end, Amroth realizes that Nimrodel isn’t arriving and as a sudden wind blows his transport beyond sight of the shore of Middle Earth, he literally jumps ship into the sea like “an arrow from the string” and “neither Nimrodel nor Amroth ever came back”. This tale is the thematic introduction we are given to Lothlórien and although it is quite ominous, Legolas later tells us that it is actually only because the Elves heard his song across the Nimrodel that they allowed the Fellowship to draw near and not “shoot [them] in the dark”. The story of Nimrodel is alluded to again a couple more times later in the book but the most interesting of these is right away at the end of this chapter. 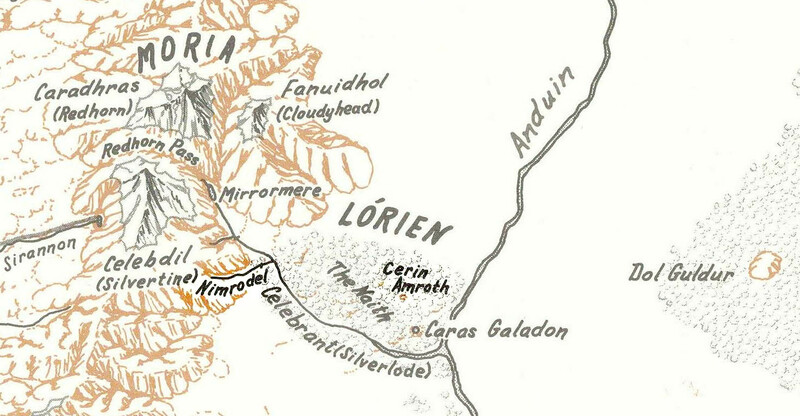 After Haldir leads the Company deeper into the kingdom of Lórien, he, Aragorn, and Frodo come to Cerin Amroth, a “great mound, covered with a sward of grass as green as Springtime in the Elder Days”. Once the home of Nimrodel’s king and lover Amroth, Haldir refers to this mound as “the heart of the ancient realm” and offers to climb it with them to experience its wonder and survey the land. 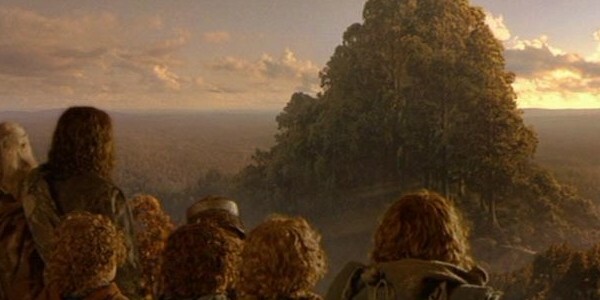 The Fellowship gazes on Cerin Amroth in “The Fellowship of the Ring” film. When they come down, Frodo sees Aragorn “wrapped in some fair memory”, “standing still and silent as a tree”, holding a golden elanor flower. Aragorn says “Arwen vanimelda, namarië!” which means “Fair Arwen, farewell!” He takes a deep breath, smiles, and returns to Frodo. The chapter ends with the cryptic narration that “he left the hill of Cerin Amroth and came there never again as a living man”. It is not until Appendix A’s “Tale of Aragorn and Arwen” that we learn that it was upon this same hill, Cerin Amroth, that years before Aragorn and Arwen had met for just the second time and “plighted their troth and were glad” after years of separation. We also learn that much later, after Aragorn dies, Arwen comes back alone and dies here, “[laying] herself to rest… and there is her green grave, until the world is changed, and all the days of her life are utterly forgotten by men that come after.” With this information, we can surmise that Aragorn was remembering Arwen’s promise to him upon that same hill 38 years earlier and perhaps even anticipating his passing 123 years later. So what are Tolkien readers to make of these allusions to the tragic romance of Nimrodel and Amroth, the stream and the hill, the healing and the heart of the Golden Wood as a frame for the Fellowship’s trip into Lórien and the love story of Arwen and Aragorn? First of all, the Lay of Nimrodel establishes Lórien as a place that was once much happier and secure before the coming of the Shadow, setting up the scenes of foreboding darkness that will play out at the Mirror of Galadriel. Secondly, it shows how the Tale of Arwen and Aragorn is a kind of rebirth of the glory of the Elder Days, as the key events of their romance are intertwined with the lore and locations of Nimrodel and Amroth’s love. Finally, it sets up some interesting comparisons. When faced with the threat of growing Shadow, Arwen chooses to remain in Middle Earth rather than flee in terror as Nimrodel did while Aragorn stays committed to “the dark roads” of the quest before him rather than revoke the responsibility of his kingship to pursue the safety of his lover. This resolute courage and duty, even when compared to Elvish legends within Middle Earth, is what makes Arwen and Aragorn our heroes. The card art for Daughter of the Nimrodel was also created by Magali Villeneuve who we met in my introductory post. Among the talents working for FFG, she has definitely emerged as an early favorite here at the Master of Lore! It is clear why this evocative piece was chosen for art sleeve treatment along with the most famed icons of Middle Earth. The second image is by Liga Marta Klavina who has some of her splendid pieces, including several Tolkien themed works hosted at Elfwood. Finally, I want to showcase the third piece below by Margherita Bientinesi, an Italian artist who features her work on RedBubble. Enjoy! 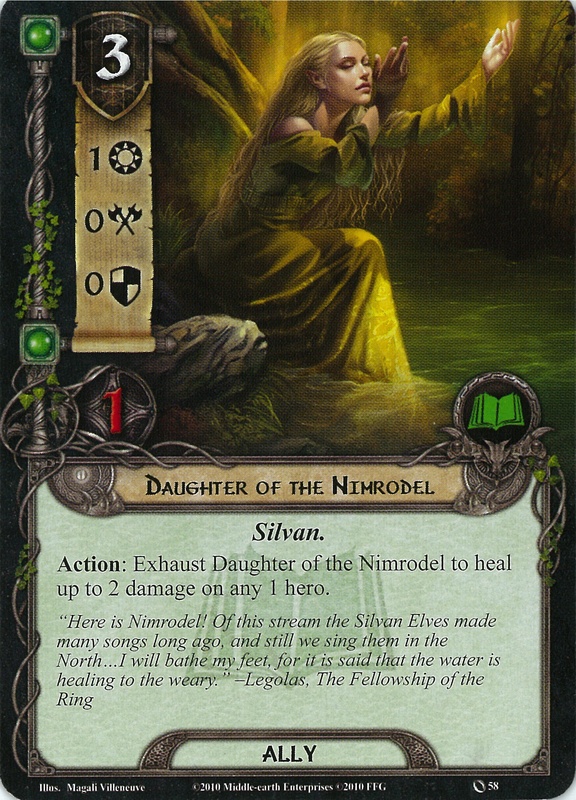 So what now are we to make of Daughter of the Nimrodel as a thematic character to play in the LOTR LCG? 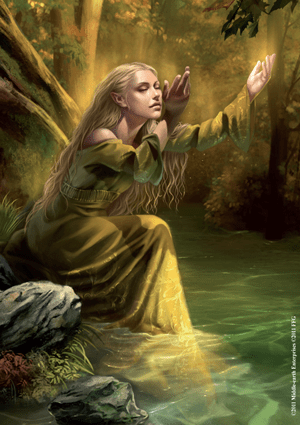 It is clear from the flavor quote that “the Nimrodel” is referring just to the stream and that the radiant figure portrayed in the card art is not actually Nimrodel or even her daughter but rather another Elf who lives nearby and can regularly attend to the water’s healing flows. If Daughter is in your deck then, you can imagine her exhausting to bring pails of healing waters from the stream as balm to the weariness of your heroes, perhaps even bathing their feet as she sings to them the tragic Lay of Nimrodel (here this female artist’s rendition would be more appropriate). That said, it seems a heavy and inefficient endeavor to haul pails of the Nimrodel’s water around Middle Earth with your Company, which perhaps is why this Daughter must pay a relatively high cost of 3 resources to come into play and therefore has no strength left to attack or defend. In this respect, I give this card the highest marks for thematic stats and ability! 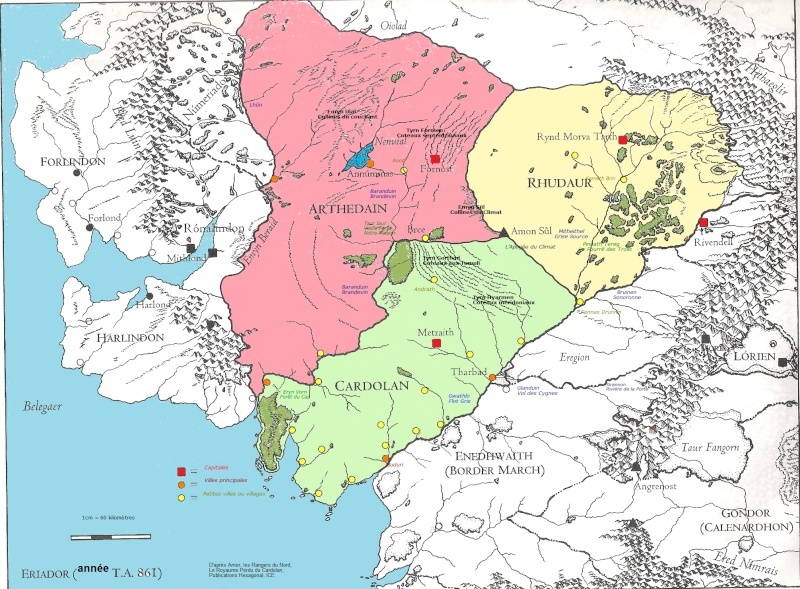 In terms of scenarios in which her presence would make the most story sense, the Dwarrowdelf cycle would be the obvious choice since the source of the Nimrodel is in the Misty Mountains. Specifically, it flows from the foothills of Celebdil (see map above) which is a victory point location in The Redhorn Gate scenario. 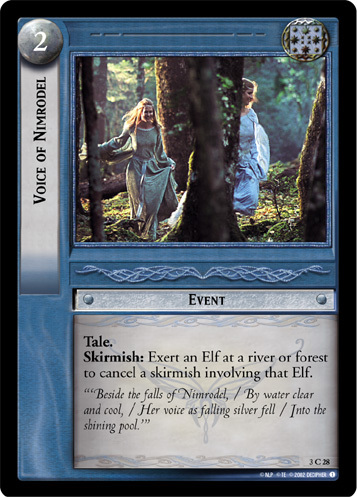 Therefore, my recommendation for the best thematic play of this card would be to bring Daughter of the Nimrodel into play when Celebdil is the active location as she would be more likely to get there from her stream-side treehouse carrying unwieldy pails than any other location currently in the game. I’d also suggest using her while your company is still traveling Up The Pass in the first quest stage because once you reach Snowdrifts and The Mountain’s Peaks in stages 2 and 3, there’s a real possibility that her water will freeze before she can work its healing wonders on your heroes! Use just after Gandalf has been discarded for a most thematic play! When I started playing, I often included Daughter of the Nimrodel in my decks as my favorite and most flexible healing card as her action is both repeatable from round to round (unlike Lore of Imladris) and able to be used on any character of your choice (unlike Self Preservation). Of course, you do pay for that flexibility, but especially in cooperative play with a mono-sphere Lore deck, it seemed worth the cost. Of course, that all changed after The Long Dark expansion and the introduction of the Warden of Healing. Unlike Daughter, this guy actually has some training in how to “patch the rents made by men of swords” which is clearly going to be more effective (and therefore cheaper in resources) than simply living near a healing stream and toting its water around in order to help people out. 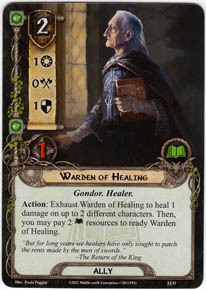 At 2 cost, the Warden has become my go to healing effect, especially in decks with Elrond lending his ability to the cause. I must say now however, that as Heirs of Numenor has arrived, I’m finding my characters are sustaining battle damage at whole new levels and the individual attention offered by a dedicated Daughter of the Nimrodel at your feet healing 2 wounds might let a character survive to face another attack whereas the Warden’s battlefield medic mentality of just putting 1 bandage on before moving to next guy might not be enough to get someone sufficiently healed for the next Southron assault! And now that you can run this blog’s most favorite card, our dear Daughter isn’t as costly or inefficient as she once was. Just say “ally” and make sure that you sing the Lay of Nimrodel while remembering Arwen and Aragorn’s history upon Cerin Amroth as you enjoy that 1 resource discount. Then you’ll have taken your first step towards becoming a true Master of Lore. Great first card choice as this is definitely one of the more unknown lore cards. Good writing and ofc great artwork! Nice first post! I learned much about the lore behind Daughter of the Nimrodel, and I’ll never look at her quite the same when I put her into play, which is a good thing. Great work here! I read a few of your more recent posts and decided I should just star from the beginning. Thanks Nate, I hope you enjoy the site! What a comprehensive article! Lore, card comparisons, maps, and audio clips! Thanks so much!